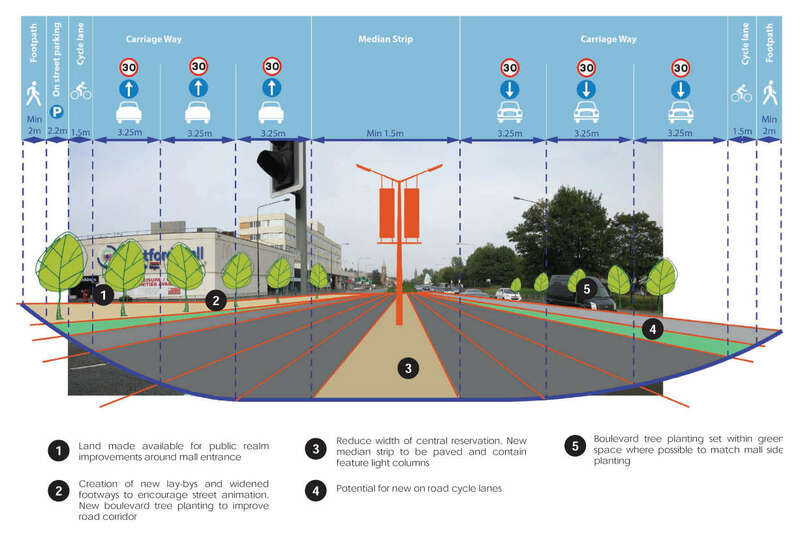 At this month’s Trafford Cycle Forum, WSP presented the proposals for Stretford public realm that they and Gillespies have been working on with Trafford Council. The proposals cover the area immediately around the town centre, covering the Chester Road, Barton Road and Kingsway triangle. This area has long suffered with outdated, poor quality roads, where cars dominate and pedestrians and cyclists struggle to get around. Typically, there’s a number of subways and barriers to funnel pedestrians away from the traffic, making access to the town centre from any of the surrounding areas difficult. The proposals aim to improve the public realm around Stretford town centre, while reducing the impact that Chester Road, Barton Road and Kingsway have in isolating the town centre from the rest of Stretford. Anyone who’s watched the decline of Stretford Arndale, now Stretford Mall over the years knows something needs to be done to revitalise Stretford town centre. Many in the community would welcome the demolition of the Stretford Mall. But I’m a little more pragmatic, there’s much that can be done while keeping Stretford Mall, I believe. The Chester Road, Edge Lane and Kingsway junction acts a significant barrier to pedestrian and cycle access, with the only access being through the subways. As subways go, these are of a reasonable standard, and I’ve certainly seen much worse. Though as with many subways, you often see people jumping barriers and risking crossing up to seven lanes of 40mph traffic to avoid using the subways, either to save time or because of perceived safety issues. The proposals include the creation of new at grade crossings on all sides. These will help reduce the separation, making it possible to cross the junction without using the subways. It is also proposed that all of the subways except the north side Chester Rd crossing be removed, with the land used for other purposes. I welcome the introduction of at grade crossings, but I think the subways should be kept on all sides. As useful as it is to have the option of not using the subways, particularly at night. The subways do actually provide a safe, convenient and quick way of crossing the junction, especially on bike. This is particularly true of families accessing the Bridgewater Way for leisure use, from over the other side of Chester Road. I was initially quite impressed by the brave decision to reduce Chester Road to four lanes in the proposals presented at the cycle forum. Unfortunately, this turned out to be a mistake, as once electronic versions of the proposals were emailed round, Chester Road was back to six lanes. 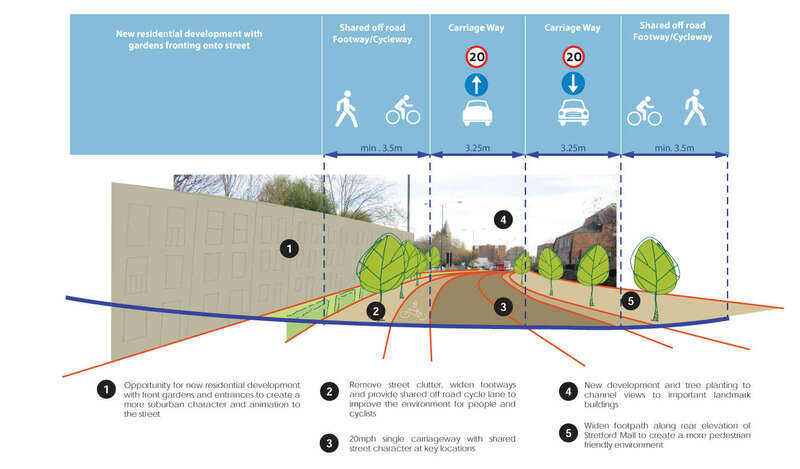 The proposals for Chester Road include a narrower central reservation and removal of barriers. They also include additional new parking bays on the Stretford Mall. These will be a welcome addition to encourage new businesses into the mostly empty street facing units and is something that’s been quite effective further along Chester Road. Unfortunately, proposals also include a 1.5m on-road cycle lane, with no segregation. This seems to be an afterthought and is a significantly wasted opportunity, given there’s plenty of opportunity to include fully segregated cycle provision. It’s made worse by the fact that where the new parking bays are, the cycle lane is right in the door zone. Proposals include a reduction to 30mph from 40mph. This will be a welcome change to locals and commuters alike, who’ve long campaigned for a reduction. Unfortunately, as Chester Road will remain at six lanes, there will little to discourage motorists from doing 40mph, unless enforcement cameras were to be fitted. Proposals for Kingsway are significantly more dramatic and with traffic calming measures very reminiscent of Poynton. The road is reduced from four to two lanes and the central reservation and barriers have been removed. Proposals include a reduction to 20mph, which again, will be welcomed. The proposals include a min. 3.5m shared footway/cycleway. Again this seems to be an afterthought and wasted opportunity. As with Chester Road, there is plenty of space to include fully segregated cycle provision. What this means, is that experienced riders won’t bother to use the shared use facilities and will continue to use the road. As the road has been narrowed, expect to see some of the issues identified in Poynton by As Easy As Riding A Bike. Less experienced riders will use the shared use facilities that likely to be busy with pedestrians, so expect to see a lot of conflict. Outside of the poor quality cycle infrastructure, I have concerns that the traffic calming measures may not be appropriate for the amount of traffic that passes through Kingsway, particularly at the morning/evening commute. As much as I’d like to see the amount of traffic reduce, I’m not sure where it would go to. It’d likely impact the other routes heading west from Chester Road, such as Barton Road and Davyhulme Road East. Barton Road proposals are modest, but generally welcome. There’s a reduction from four to three lanes, with there being one fewer north bound lane. Barriers have been removed and pavements improved, which again, are welcome. The lack of any cycle infrastructure is a disappointment. Barton Road is a popular route for commuters heading to the Trafford Park or The Trafford Centre. Providing dedicated cycle infrastructure here should be a no-brainer. The proposals do little to address the problems with speeding along Barton Road, which makes Barton Road more of a barrier than it should be. Anyone who’s cycled or even driven from Barton Road southbound to Chester Road will know how necessary changes to the gyratory are. Being dumped into the third lane of Chester Road, to deal with three lanes of traffic is not an experience anyone should face. Three options are presented in the proposals, with option 1 being to keep the gyratory as it is. The other two options look like they’d provide a significant improvement for Barton Road traffic. Unfortunately, the proposals are lacking in detail, including whether or not there’s any cycle provision. I suspect there isn’t, which would be a massive disappointment. So, there you have it. 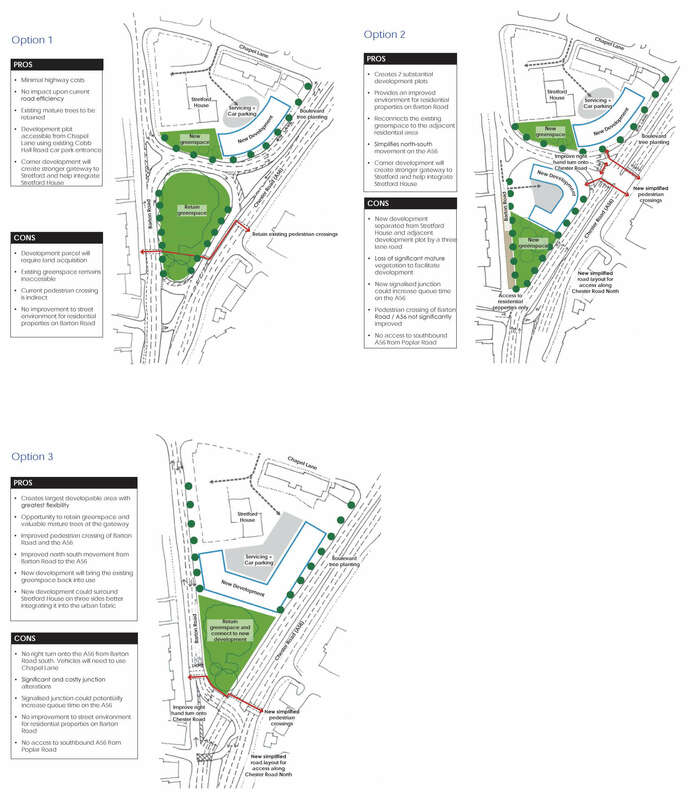 Overall, these proposals appear to address a number of the public realm issues that have dogged Stretford for many years. Combined with good management of Stretford Mall, they could go a long way bring new life into what has been a town centre in terminal decline. Unfortunately, the opportunity to provide safe, accessible cycle infrastructure for all ages and abilities has been missed in these proposals. This appears to be more due to a lack of vision than anything else. I’m hoping Trafford Council will engage further with the local community and take on board their comments. Up to now, there’s been very little awareness about the proposals, due to a lack of visibility of the plans. After writing this, I emailed the consultation email with a link to this post. Today, I received the following response from the Growth and Masterplan Manager at Trafford Council. The northern subway is being retained for this very reason, to cater for cyclists from residential areas around Victoria Park wishing to access the Bridgewater Way cycle link. Where we are currently proposing the removal of some of the subways this will release land for additional town centre development and/or landscaping. Any such changes will be subject to a road safety assessment. The lane reduction is currently being examined in traffic capacity terms, however for the current time there is no firm proposal to reduce the number of lanes. Likewise, as explained to the Forum in person, the proposal to reduce the speed limit to 30mph remains only a long term aspiration and will not be possible without physical measures such as lane reduction. The intention is to retain the existing cycle provision along Chester Road, conscious that this north-south axis is supported by the route along the Bridgewater Way, which caters for the more leisure oriented cyclist who wishes to avoid Chester Road. On-street cycle lanes to the appropriate standards are now proposed in both directions. n.b. the 20mph reduction is not currently being pursued, this is an omission on the plans used for the consultation. The reduction in lanes on Barton Road will assist in addressing any existing speeding issues, and therefore make the route more attractive for on-road cycling. Cycle lanes will be retained in areas where there are currently cycle lanes provided. In addition advanced stop lines will be provided at the signal junction. As was noted at the meeting of the Cycle Forum the proposals are at an early stage and your comments are helpful in shaping how they are taken forward. The draft report will be completed this month and initially shared at a joint meeting of the Stretford Working Group and Panel on 21 July ( for information this includes representatives from Stretford Mall, the Stretford M32 group, local Councillors, residents associations and local businesses). Additional transport modelling is being completed by TfGM over the summer after which there will be wider public consultation in relation to the draft proposals. I hope this is helpful and thank you again for your interest and comments. Although I can see the benefit of releasing the land for development. Just leaving the northern subway will mean that those wanting to access the Bridgewater Way will have to negotiate crossing Edge Lane after cross Chester Road through the subway. With four lanes of traffic, this is often unpleasant and dangerous at the best of times, with long waits at the crossings and either speeding cars or choking fumes, depending on the time of day. It’s disappointing that the lane reduction is only being examined at the moment, but from what was shown in the plans, not entirely surprising. The fact that the speed limit reduction to 30mph is only a long term aspiration is a massive disappointment, for all of Stretford, not just those on bikes. I genuinely cannot see the point of making any changes to Chester Road without a reduction to the speed limit. The intention to retain the existing cycle provision is very worrying, partly because of how poor the existing cycle provision is and partly because Trafford Council would actually class this as cycle provision. Anyone who’s had the displeasure to ride along Chester Road will know laughable this is, on what is a 40mph road. As any weekday user of the Bridgewater Way knows, it is now overrun with commuters on bikes at peak times. This is already leading to a lot of conflict between the different users of the Bridgewater Way and will only get worse as numbers increase. There needs to be proper cycle provision on what is the key route through Trafford. Not just to inadequate, half-hearted provision to discourage those on bikes from using it. Assuming that on-street cycle lanes means paint on the road. Then it’s debatable whether this is actually an improvement on the the 3.5m shared footway/cycleway originally described. Why can’t Trafford Council commit to a fully segregated cycle path here? The decision to not pursue the speed limit reduction to 20mph along Kingsway is another major blow to the proposals. “Cycle lanes will be retained in areas where there are currently cycle lanes provided.” means that cycle provision will be pretty much non-existent through here as it is today. Again, another disappointment as the opportunity to rectify one of the most dangerous areas in Stretford for those on bikes has been missed. The inclusion of ASLs is a token measure. As we know, they’re dangerous, mostly ignored by motorists, give a false sense of security and are being phased out in countries with more advanced cycle infrastructure. As I said earlier, it’s good to see Trafford Council appearing to engage on this consultation. But it’s very difficult to see how any of the comments made here could have helped shaping the changes mentioned above. Given the lack of a reduction in speed limits on Chester Road and Kingsway, and no significant changes to cycle provision or road layout other than what may happen at the gyratory, I’m struggling to see what actual benefit the public realm improvements actually bring. So, all we’re left with is the removal of three subways, some at grade crossings (are these possible without a reduction in the speed limit? ), traffic calming on Kingsways and the possibility of improvements to the gyratory. If that’s the case, I don’t think the proposals offer any real benefit to anyone and I suggest Trafford Council save the money until they can propose something worthwhile. I’ve not had chance to digest the changes, but initial impressions are disappointing, with the published proposals being even less ambitious than the ones emailed previously. I don’t quite understand the reluctance not to use 3.0m wide lanes – providing pedestrian or cycle infrastructure can be a matter of mm and the extra 250mm or 750mm they could get, per lane, could make all the difference for peds and cyclists comfort. It should also have a speed reducing effect, given they’re looking at 3-lane dual carriageways being subject to 30mph limits. Narrower lanes would make a lot of sense. It’d make a big difference to the space available for cycle provision and as you say, reduce the traffic speeds. Is 3.0m minimum? If you’re looking at allowing for buses and HGVs then narrower (i.e. 2.75m) is pushing it really unless the road is arrow straight, or unless general traffic flows and speeds are very low (e.g. on residential estates, etc.). Figure 7.1 on page 79 of Manual for Streets gives a guide to how vehicles fit.